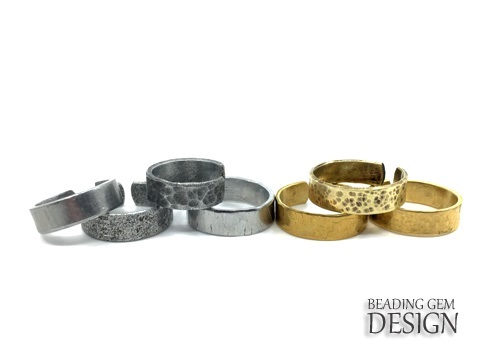 One of the easiest ways to make ring bands is to start with metal bands. No soldering required! 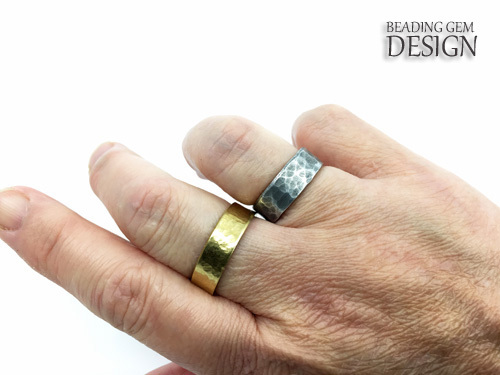 Long time readers might remember the easy stamped ring tutorial I shared a while back. I also like contemporary rings. Texturing them with hammers is an easy method for simple ring style. I have discovered much better ring blanks since that tutorial. 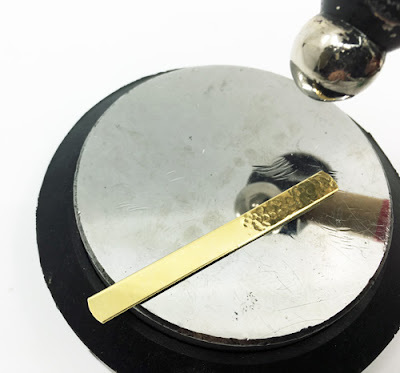 These ring blanks come in different lengths and different metals and are used a great deal for stamped metal jewelry - see examples on Etsy here. 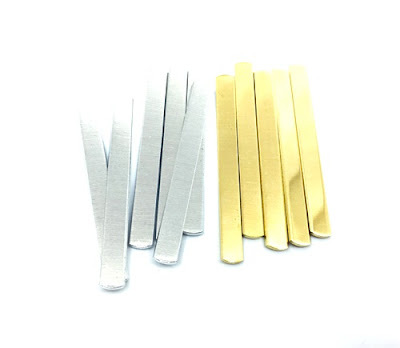 I have bought from two different suppliers - they also sell bracelet blanks. Lizz Barnes of GottaGetaDeal. 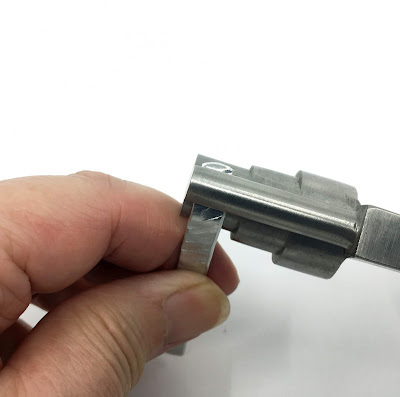 Christopher Helsinger of LostandFoundries is an excellent Canadian seller. I bought aluminum and brass blanks which are great substitutes for precious metals. They are 16 G and 1/4 inch wide. They come in different lengths. The blanks are polished. The aluminum is high quality and food grade. 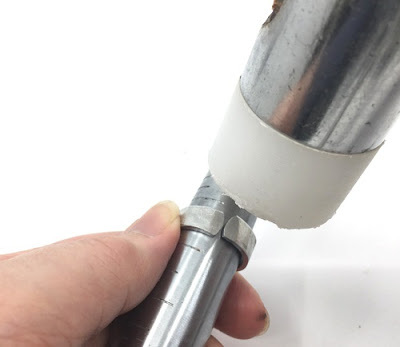 One of the easiest - and my favorite - ways to texture is to use the round end of a ball peen hammer. 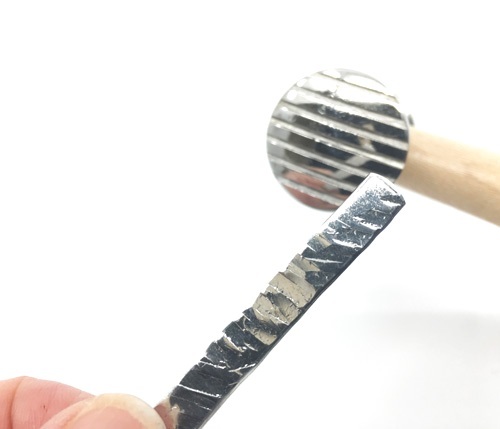 Just sharp taps on a metal block will introduce dents. 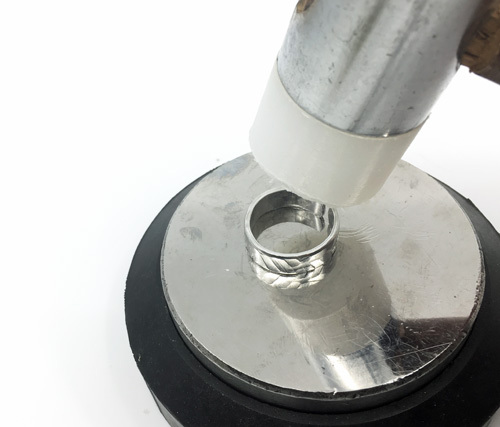 If the ring blank is bowed after texturing, just turn it over and hammer it flat with a nylon hammer. 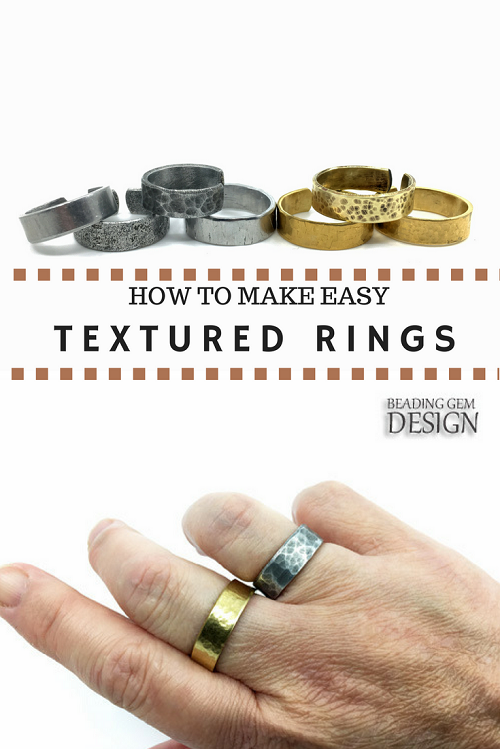 Textured rings are fine on their own. But I added a patina to help make the textures more obvious in photos. Rings get a lot of wear so the patina will only stay in the low points anyway. I am not fond of liver of sulfur because of the smell. 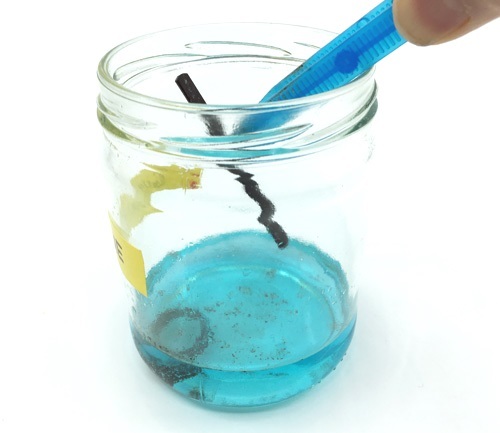 The liver of sulfur gel has to be dissolved in warm water - once done, this solution will not keep. I now use Gun Blue (Canadians can get it in the hunting section of Canadian Tire) after I saw it used as a patina during a Grand River Bead Society class. 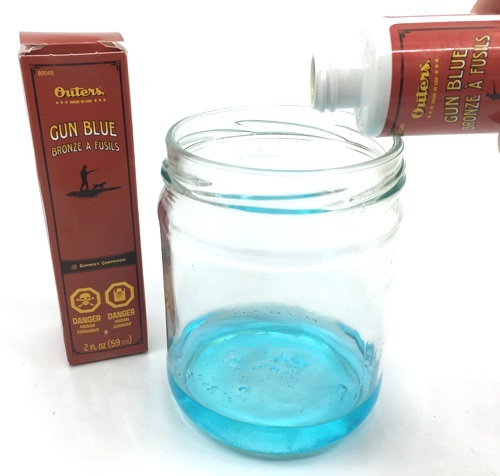 Gun Blue is generally used to treat and protect steel used in firearms. The oxidation turns the metal blue-black, hence the name. 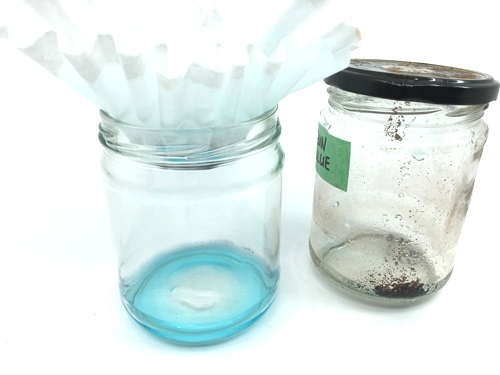 Another reason why I used Gun Blue is because liver of sulfur does not work on aluminum. The process is very fast - within a minute. Notice I use plastic tweezers to fish out the rings to rinse them in water? Metal tweezers will be oxidized. I experimented with oxidizing a formed ring as well. Verdict? Much easier to polish when the ring is still flat!! I used steel wool #0000. I used a ring forming pliers to shape the rings. 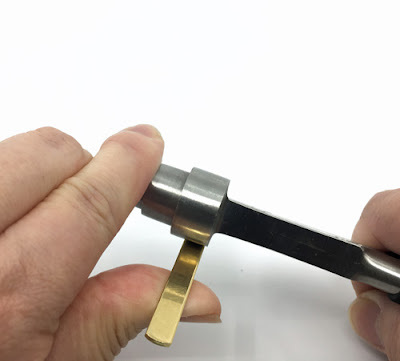 I found it easiest to slowly begin at one end and use the smallest mandrel at first. Then I worked around the ring using the larger mandrels. 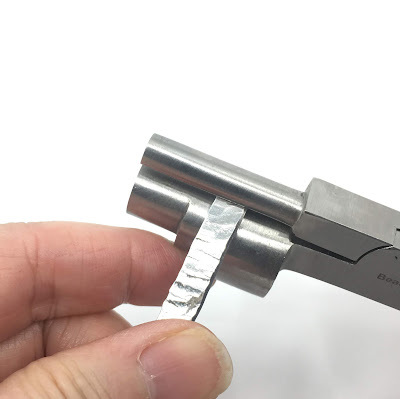 These 16 G blanks do require some force to bend them. So the pliers help a great deal as the jaws can grip the blanks. You can't really shape them on the ring mandrel alone. Final shaping and sizing is then done on a metal ring mandrel. Also hammer the rings in this fashion if they aren't resting flat all around. 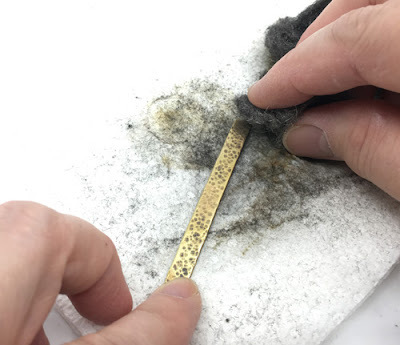 The black oxidation is a pretty aggressive process. 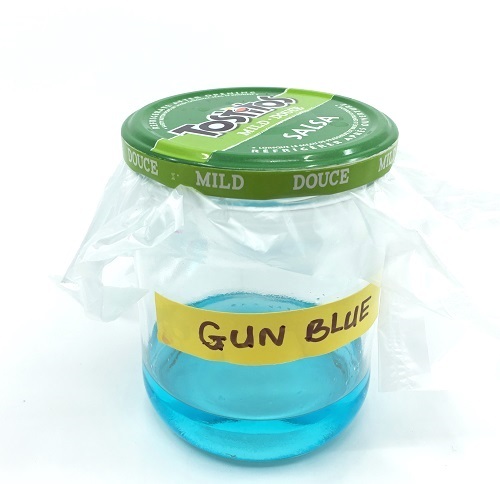 Please do not dump leftover Gun Blue down the sink. It is not good for the environment. So filter out the black bits using a coffee filter into a clean fresh jar. I try and use jar lids with liners in them. Even so, the lids still corrode during storage. So I am trying this method now of using some thick plastic to separate the solution from the metal lid. 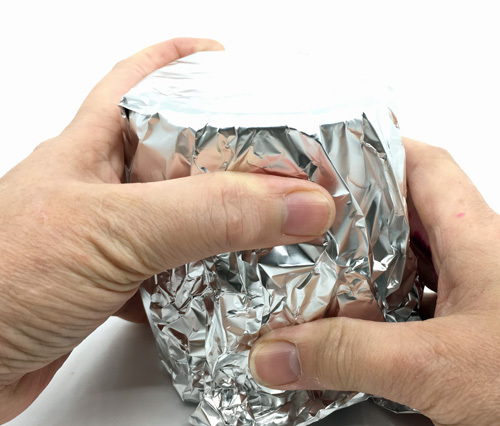 I store the jar wrapped in aluminum foil to keep it dark so it will not degrade. I store the jar in a safe place out of reach of children and pets. The left most ring below is untextured aluminum. The second ring from the left was left for too long in Gun Blue. 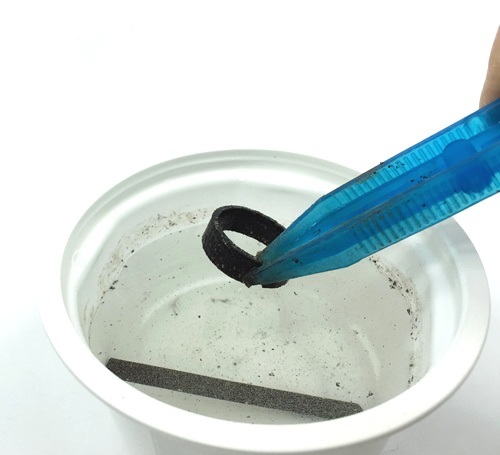 That is why it has tiny pits where the corrosive process went further. Aluminum does slowly patina on its own. That is why you get blackish stains on skin. I use aluminum jump rings for chain maille. The blackish stains tells me it is time to shine them up in the tumbler!